Stir. 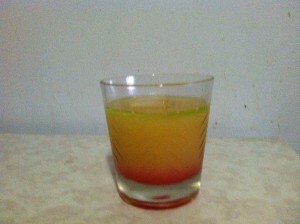 Add a dollop of grenadine syrup, which will fall to the bottom of the glass. Float a half-shot or so of absinthe on top. You can either sip the absinthe off the top, or stir the drink before consuming. I expect I’ll be doing more research on this one. I’ve been working hard with producer Kevin Johnston and with artists Dave Daily and Albert Hinojosa, and some of the early bits of this new album are starting to fall into place. 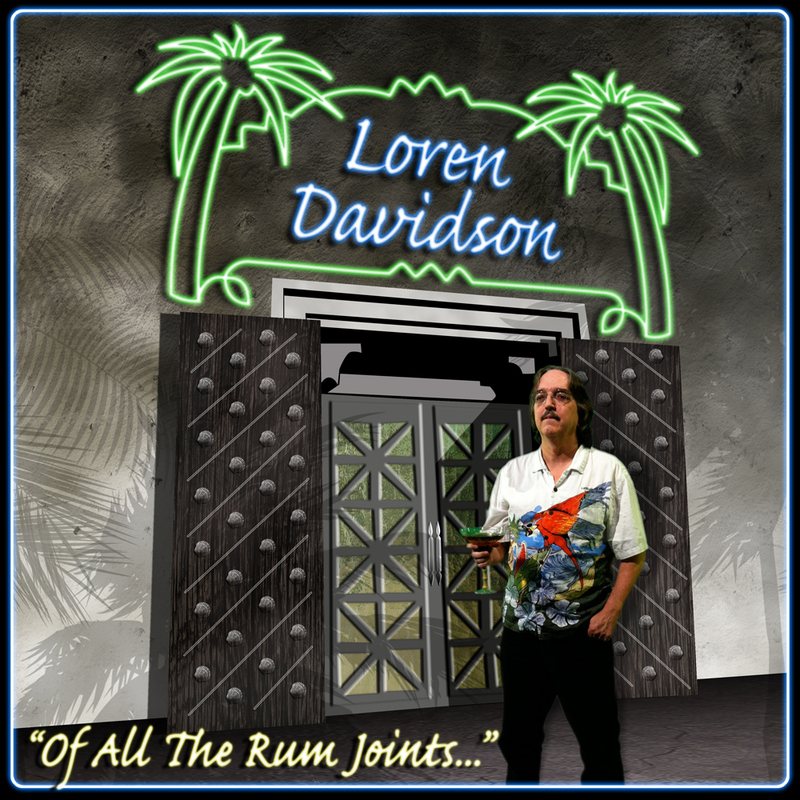 The title, as you may have heard, will be “Of All the Rum Joints…” It’s my fifth album, and the second on which I’ve used a song lyric for the title. Albert is responsible for the new Cafe Tropicale logo, visible in a slightly altered form in the album cover graphic. Dave took that logo and some other bits of guidance from me and created this way-cool cover concept. They’ve both done excellent work so far. Dave is also working on a couple of T-shirt ideas for me right now. Here’s a list of the other songs on the album. The links, where provided, are to “snapshot in time” and “homebrew” versions; the songs have continued to evolve, and will likely be different on the album. But still worth listening to. “Green Flash” – upbeat and using an alternate guitar tuning, this is a song about watching sunsets for that elusive and rare atmospheric phenomenon known as a “green flash.” And it’s about the journey being as important as the destination. Stuff like that. “Looking at You” – A few months back, I realized that the song “Margaritaville” and the movie Casablanca pretty much had the same premise – boy meets girl, girl dumps boy, boy goes someplace with palm trees to drink it off. Which may be powerful, but isn’t very empowering. So I wrote this song, which is really “Margaritaville” meets “How Do You Like Me Now?” It provides the album title and theme. “Voodoo Lounge” – I’ve written earlier about this song, which has undergone some revision since the earlier version I posted about. We’ll be going musically to some of the less savory corners of New Orleans to flesh this one out. “Fly Away” – This was inspired by a couple of other songs, that I won’t name here. It’s upbeat and lively and hopeful, because I think we all need that to look forward to every now and then. “One More Rum” – This song took shape one day as I was contemplating one of the Greatest Lies in the World – “C’mon, man, we’re only going to have one more round and then we can go home.” Never happens. It’s becoming the signature “last song of the night” when I play, and will be the last song on the album. “Pontiac Motel” – This song has no beaches, no boat drinks, and no bars in it. I’ve had the title kicking around in my “hook book” for at least five years. It’s really a counterpoint in some ways to everything else I write – we fantasize about walking away from our jobs now and then, but there’s an entire class of people who don’t have jobs – the homeless – who probably fantasize about having lives like the ones we fantasize about escaping from. And if your employer were bought out tomorrow, or went out of business, or just decided, “hey, let’s let a bunch of people go,” how many paychecks are *any* of us away from living on the streets? “Island Moonlight” – Everyone loves being in love…right? But even the best romance has its bad days, and sometimes you question whether it’s all going to work out. In this song it does, thanks to the magic of island moonlight. “Way Out” – In addition to an interesting play on words in chorus, this song is going to put the “rock” in “trop rock.” Really. I was stretching my writing skills in a particular direction, and this is what emerged. “Somewhere, Someday” – One man’s dream of Paradise. “Tropical Therapy” – Because I’d been trying hard *not* to write Yet Another Margaritaville Near-Clone for many years, and realized that I’d succeeded. So, having proved I could write nearly everything else, I proved I could write this too. “Living Key West” – One of my friends is musician Howard Livingston, who posts about his carefree, happy life in the Florida Keys. A lot. Some might even say to excess. I say it’s easy to live on Key West Time when you’re in the keys; it’s a bit more of a challenge for those of us in the “upper 48.” But it can be done, and this song is about how I do it. Any resemblance between my song and Howie’s is out of love, done with his blessing, and as far as I can tell, doesn’t cross any legally bad lines anyway. One of my Key West friends just got a cool new gig. His name is Jack Terry, and for the past few months he’s been in competition to become Tommy Bahama‘s new rumologist. You can read the announcement here. Jack is very nice people. He’s a bartender, of course, and an author in his Copious Free Time. I’d known him online for a while, and got to meet him back in June when I was in Key West. If anyone deserves something like this…it’s him. I look forward to hearing the stories he’ll be able to tell by this time next year. I hope it’s a fun and worthwhile ride.